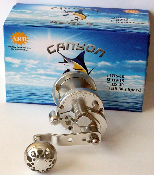 Canyon Reels HS-15 High Speed Jigging Reel is unmatched in power! Incredible power and super smooth performance make the HS-15 the perfect choice for jigging, bottom fishing, drifting and just about any use that you can think of! A large, deep spool with the capacity to hold 500 yd. of 40# braided line and the extreme free spool performance also make the HS-15 a great choice for surf casters. Available in a variety of colors, the HS-15 is the finishing touch for many specialty rods and custom rods available today. Weighing only 13.4 oz., the HS-15 is an ultralight powerhouse that outperforms reels that are more than twice its size and weight! Backed up with a one year warranty, the HS-15 is built to last. Every reel is loaded with Cal's Drag Grease to provide the fisherman with one of the smoothest operating drags on the market! 25 lb. of drag at free spool! Gear Ratio: 6.1:1 ratio is designed for high speed jigging!